Interview by Emily Skov-Nielsen, Marketing and Promotions for The Fiddlehead. Rebecca Thomas will be in Fredericton on August 25 to give a workshop "Writing Your Guts Out" from 2-4 at the Fredericton public Library and to give a reading later that evening at 7pm, also at the Fredericton Public Library. For more information, visit the Facebook event here or scroll down to see the poster. Dominique Bernier-Cormier's poems have recently appeared in The Malahat Review, The Puritan, and Poetry is Dead, and won honourable mentions in CV2's Young Buck Poetry Prize in 2015 and 2016. His first chapbook, Englishing, will be published this spring by Frog Hollow Press. Editorial Assistant Jenna Albert conducted this interview by email in mid-March. Jenna Albert: First of all, congratulations on winning the 26th Annual Ralph Gustafson Poetry Contest. You must be ecstatic! Three writers: Birgül Oğuz, Karen Villeda, and Betsy Warland. Three different countries: Turkey, Mexico, Canada. Each writer grapples with gender and identity, with loss, with the limits of language, with persistence against the conspiracies of silence, with responding to violence as part of the quotidian, as part of civilian life. On the surface these writers appear to have little in common, and yet their answers, though written separately and thousands of miles apart, seem part of the same conversation. Michael Eden Reynolds has won our 25th annual Ralph Gustafson Prize for Best Poem for "False Dichotomy or Monocot." Michael Eden Reynolds’ first book, Slant Room, was published by PQL in 2009. His second manuscript, Elsewhere Thought Known, has already been published in a parallel universe. Michael lives in Whitehorse where he works as a mental health/addictions counsellor. Rachel Rose's poems "Corona for Charlotte," "Good Measure," and "Sunflowers" appeared in The Fiddlehead Autumn 2015 issue. Rachel Rose is currently Vancouver’s Poet Laureate. She has published four collections of poetry: Giving My Body to Science, Notes on Arrival and Departure, Song and Spectacle, and most recently, Marry & Burn. She is also a short story writer and an essayist whose work has been published in literary magazines and anthologies across Canada and the United States. Her poem, “Sunflowers” (among others), is featured in The Fiddlehead Autumn 2015 issue. Sean Howard has won our 24th annual Ralph Gustafson Prize for Best Poem for "Cases (Unbound Poems, from Nova Scotia Reports)." Sean Howard is the author of Local Calls (Cape Breton University Press, 2009) and Incitements (Gaspereau Press, 2011). His poetry has been published in numerous Canadian and international magazines, nominated for a Pushcart Prize in the US, and anthologized in The Best Canadian Poetry in English (Tightrope Books, 2011 & 2014). Sean lives in the lobster-fishing village of Main-à-Dieu, Nova Scotia, and is adjunct professor of political science at Cape Breton University. By Phillip Crymble Kayla Czaga has won our 23rd annual Ralph Gustafson Prize for Best Poem for "That Great-Upholstered Beacon of Dependability." 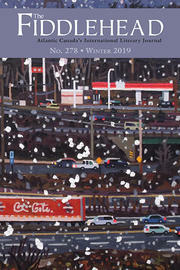 Kayla Czaga won The Malahat Review’s 2012 Far Horizons Award for poetry. Her poems have appeared or are forthcoming in The Walrus, The New Quarterly, Best Canadian Poetry in English 2012, Arc, and others. Her first book, For Your Safety Please Hold On, is forthcoming this fall from Nightwood Editions. She lives and writes in Vancouver, where she is completing her MFA at UBC.